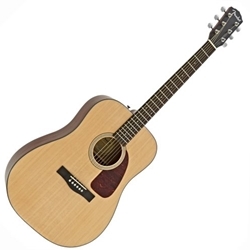 The CD-140S dreadnought offers full, resonant sound and great value, with a natural-finish mahogany top, back and sides. Upgrades include a new tortoise shell pickguard and mother-of-pearl rosette design, rosewood bridge with compensated Graph Tech NuBone saddle, aged bridge pins with black dots, mother-of-pearl Fender logo headstock inlay, and smaller (3 mm) dot fingerboard inlays. It features scalloped X-bracing, 20-fret rosewood fingerboard, dual-action truss rod, and die-cast tuners. Case sold separately.